Bend’s thriving craft beer culture is attracting collaborations from brewers near and far. That cross-pollination of talent and ideas inspires local brewers to up their game and gives beer drinkers the opportunity to try unique and limited edition takes on their favorite brews without leaving town. “Craft brewers are inherently creative. We inspire each other and constantly share ideas. 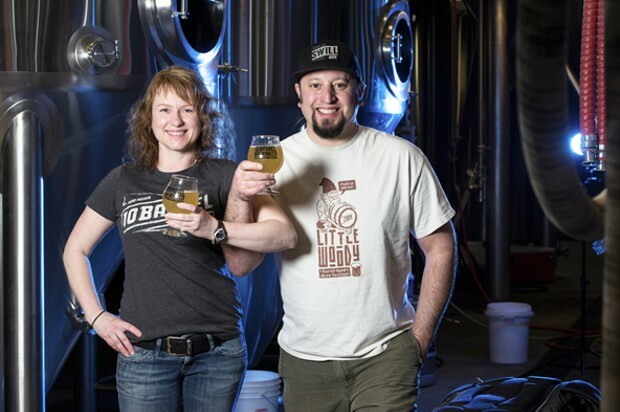 It is a natural progression to want to work with each other,” says gold-medal brewer Tonya Cornett, who currently serves as Research and Development Brewmaster at 10 Barrel Brewing. While the proliferation of craft breweries has led quite naturally to collaborations among the close-knit community of brewers, joint ventures aren’t limited to Central Oregon breweries. Take October’s Suede Imperial Porter release, a three-way effort from Bend’s 10 Barrel Brewing with far-flung collaborators Stone Brewing out of Escondido, Calif., and Bluejacket Brewing in Washington, D.C. In this case, Bluejacket’s Megan O’Leary Parisi brought honey and jasmine to evoke the harvest season, Stone’s Mitch Steele threw in calendula from the brewery’s farm, and Cornett contributed a well-loved base beer—as well as the name Suede. Next up, Cornett says the brewery will be releasing an effervescent apple-flavored Berliner Weisse with Pine Box later this month for the Seattle brewery’s second anniversary. 10 Barrel will also release a light ginger and lemon finished beer with Widmer Brothers Brewing this summer for the Portland brewery’s 30th anniversary. Boneyard Brewery, which just released its Allocation Double IPA with Baker City-based Barley Brown’s in February, will also be doing an anniversary brew with Widmer Brothers—a Blacklight Black IPA. While Allocation is only available on draft in Oregon, Brewmaster Tony Lawrence says the Widmer brew should be available in cities on both coasts. And the upcoming 3-Way IPA with Ft. George and Block 15 will mark the Bend brewery’s first foray into 16-ounce cans. Lawrence says every collaboration is different. Some come together quickly, while others take time to work out details. “Every situation is unique,” he explains. Lawrence says he and Barley Brown’s brewer Tyler Brown drew up plans for Allocation on a napkin the night before they brewed it. The 3-Way IPA, on the other hand, was a team effort involving six brewers from three breweries and many hours spent hashing out details. With brewers migrating from brewery to brewery, there’s no end in sight to the cross-pollination. Before Cornett was at 10 Barrel, she participated in the first-ever Central Oregon collaboration brew as a brewer for Bend Brewing Company with Curt Plants at GoodLife Brewing Company—the Scottish Heart Scotch Ale. Since then, GoodLife has released the Good and Worthy Belgian Ale with Chad Kennedy at Worthy Brewing. GoodLife co-owner Ty Barnett says the brewery also has collaborations on the docket with Eugene’s Oakshire Brewing and Skagit River Brewery in Mt. Vernon, Wash.